Just looking over one of my articles, I remember visiting a church at House of Prayer (180/127/33) that I had a positive experience with here in Second Life. I thought I’d pop in and it looks a lot different than about a year or so ago. However one thing struck me as strange is that they asked me to change out of my furry avatar. Kevin Jones35 Resident who happened to be on the church’s senior staff asked me to take off my furry avatar. I was baffled at first thinking that Jesus and churches would be the last thing to ask someome to change their appearance. However I didn’t want to anger a church over something silly. 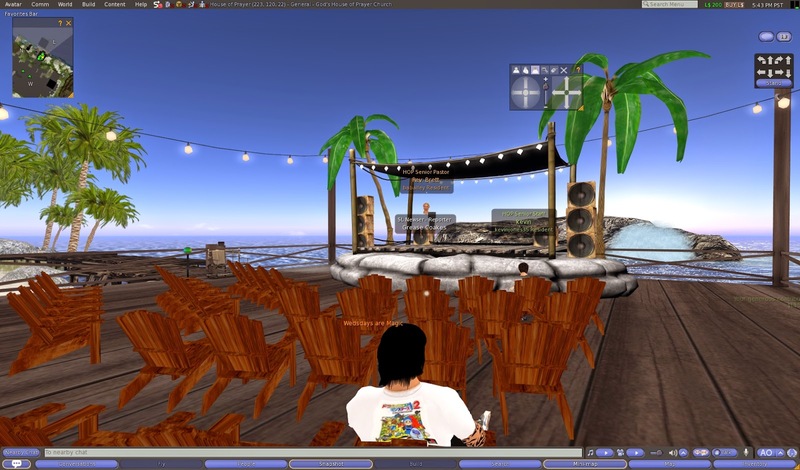 When I came on later shortly before the bible study at the beach at 6pm SLT I found a newbie human avatar and took off my AX3 fox avatar. When Kevin saw me in a human avatar he IMed me this response, "We are trying to be a rl church in sl so that was one of the rules." After taking some pictures I asked him, "But here's a fair question, wouldn't Jesus love someone equally whether someone was a furry or a human being? Perhaps you wouldn't find a furry in a real life church, but I would think a furry would be accepted within God's house." He replied, "Yes and if it where me I would not have that rule, but being on staff I try to make sure I inform others of the rule and give them time to change their avatar." Fair enough something to keep in mind if you wear paws and a tail if you visit this church. Even if Kevin didn’t agree with the rule, he still has to enforce it. At least have the decency to respect that rule. When I looked around the area I was surprised that I didn’t see just 5 or 6 avatars but I saw about 20 or so sitting in the seats. 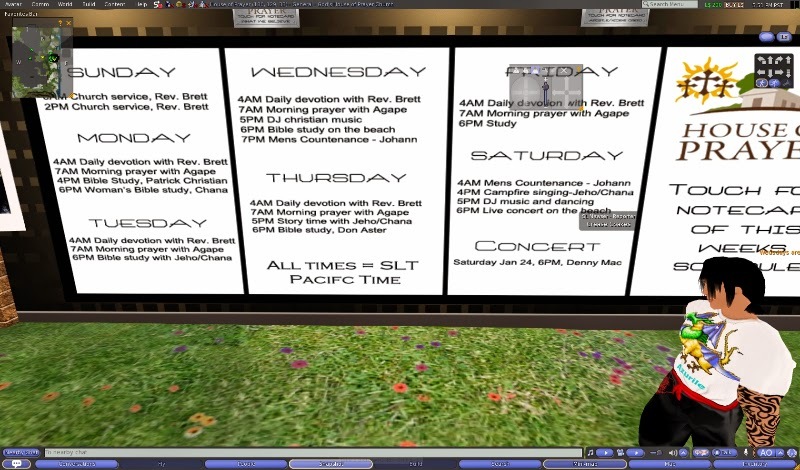 Around 6pm SLT the Rev. Britt AKA Babailey spoke at the front in voice chat. He announced there would be a men’s meeting soon after. Talking about the cold, he asked people to pray for the homeless and shut in/s that they would be able to fight against the cold. He was very thankful for the church and staff and he liked saying he liked Jesus all the time in the morning and night and to pray for other churches in Second Life. It sounded to me that he wanted to cover all the bases to pray for everything. Lots of people were typing amen in main chat and praising Jesus. That night the Reverend read bible verses over voice chat. That night he read chapter 5 from John verses 1 through 18. After reading the bible verses, he announced that it was in week 2 of a series called "straight ahead." Each week he announced he would address one of four principals. Last week he asked everyone to see everything from the eyes of God encouraging everyone to think like God. I commented, "You mean to see everyone and everything with love?" Willma PAPAPEDRO Resident happened to agree with my statement. The preacher spoke over voice chat about how people made excuses about how their lives are miserable. He was stating when people take responsibility for their actions and come to Jesus, their lives would change dramatically. He also said rather dramatically with a southern drawl that someone in the crowd was surrounding himself with excuses and didn’t know how to get back up. I wasn’t sure who he was talking about but it was entertaining nonetheless. 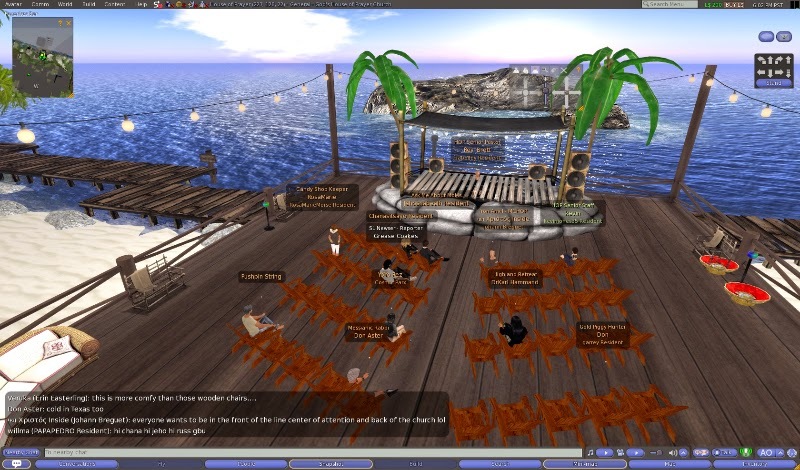 After the bible study at 7pm SLT, I was given a landmark for a men’s meeting. I said what the hey so I ported upstairs. Johann Breguet led the men’s prayer in a different room. It was more open discussion on various bible verses such as “Thessalonians 5:16-24 King James Version.” In fact Johann asked me to read this out loud, “I will therefore that men pray everywhere, lifting up holy hands, without wrath and doubting.” He talked over voice how you shouldn’t pray or talk to God angry or bitter. To me that made sense. If I had negative thoughts, maybe that’s something I should stop doing. Positive thinking creates positive results. Johann was saying in voice he’s used to his masculine voice which may sound harsh to women. I had suggested he could pray to Jesus to help with that. I had also said in voice chat that prayer is important,but you should also work towards your goals. You can’t pray all day and expect $10,000 to show up in your lap. Johann Breguet was nice enough to pray for me so I said sure. I told him I wanted him to pray for me to write more so he wished my writing to be guided by god’s hand. I prayed for him that he was would find the woman that’s right for him that would accept his strong voice. All in all I had an awesome and inspiring experience at god’s house of prayer church. I recommend going there if you’re feeling down and out. Even though it has an anti furry law if you show up as a human people there might be able to help you with your problems or anything you would like to talk about. Editor's Note: Every church the Newser has previously covered didn't have a problem with what avatar you were as long as you could fit through the door. In fact, checking Grease's previous article about the HOP, there was a furry among them as well then. I'm glad that they are doing so well, though sad about the no furries rule. My shrine allows furries and was intended to be a place where furries would be able to comfortably meet spiritual needs, and I know that the Sukhavati Pure Land parcel in Takeuti allows furries to come to services. To each their own, I can see how some would consider furry avatars to be a distraction, although I have seen "who has the best clothes" be a distraction in rl churches. I wish them well with their church. My angel bear avatar is an important part of the personality I choose to express in SL. To ask me to check it at the door is to ask me to give fellow residents an incomplete picture of myself. People at HOP made me feel VERY unwelcome when I was a newbie on Second Life and trying to find my way around. They also ignored me when i would ask ? 's 2 try & find out where things were. In 10 days I shall have been in Second Life as Spider Spinotti for exactly 10 years. In all that time I have been a blue elf, spending most of my time in the Elven areas. These days Farhaven is my home. Also a committed Christian, which my elven friends fully know about and respect. My wife and I even run a Christian group within that type of area. I have been, and still am, a member of other mainstream Christian groups in SL that fully accept my blue elf self. In RL, I am a church deacon, class teacher, and occasionally platform preacher. I visited House of Prayer for the first time today, saw the "Human only" type sign, was confused why they would have this rule in SL, but decided to wander the sim to check it out. Against common chat rules I was directly private messaged by someone representing the group, and before any real conversation, I was offered their list of rules, which I declined. Both of these stages I considered rude, and informed the person that I have no human AV, and that I had seen all the rules I wish to see, wished them well, and TP'd back home. So, anyone actually know why this rule is in place for a church in Second Life?